I'm currently working on a data model for "Project Allocation System" and I have done most of the ER-to-SQL transformations, but I'm struggling to deal with the two ternary relationships that exist in my model. One project is assigned to one student. One student is assigned to work on one project. 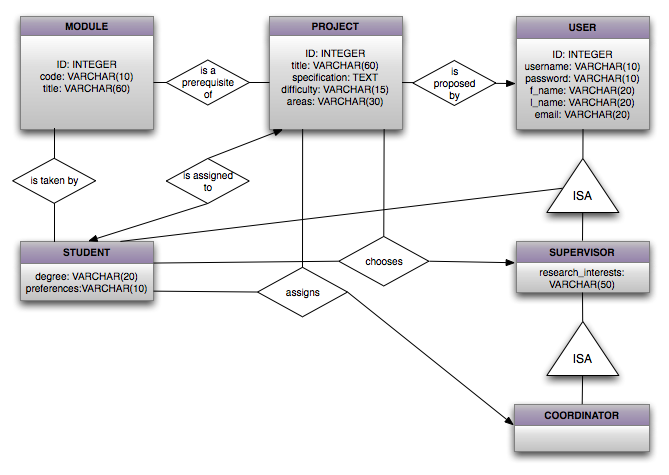 To map this relationship, project_ID is included in the Student table as a foreign key. Every project is proposed by one user. A user can propose one or more projects. User_ID will be stored in the “many side”, in the Project table as a foreign key. Every project can have zero or many module prerequisites. A module can be a prerequisite for zero or many projects. Every student takes one or more modules. Every module is taken by one or more students. In the first ternary relationship, I'm trying to express that every supervisor chooses a student for a particular project. This is important when there are more than one student who expressed an interest in a project proposed by a particular supervisor. In that case, the supervisor chooses one student according to their preference. The second ternary relationship should express that a coordinator allocates one project to every student. Did I get the cardinalities right? Also, I'm not sure how to go about mapping these relationships to relational schema and SQL tables. One more concern: i read that ternary relationships should be eliminated if they could be decomposed into two or three equivalent binary relationships in order to achieve simplicity and semantic purity. Do you think it would be possible to adjust my design so that it would only use binary relationships? I'll be very grateful for all your comments and advice. I'm also attaching a picture of the ER model - any comments on that will be appreciated, too! Hi Yugoza, I know this is fairly old post but i am stuck with the same ternary relationship problem. Were you able to map the ternary relationship into sql tables? If yes, please provide me the details. Hi, I do not know the exact design of your database, but the general rule about mapping ternary relationships is to create a new table about the relationship. The table's PK would be a composite one, composed of the three PKs of the involved entities. The table should contain the relationship's attributes (if there are ones) and should NOT contain any other of the entities' attributes but only their PK. All data in one table or one to one relationship?